In 1995, the Theatre Production class began a long range theatre project. After years of walking past an empty, weedy, and overgrown interior courtyard at the school, Mrs. Freeman Lehman had an idea. Her class that year was filled with boys who liked to build things. They loved to build sets and went at it with great gusto. After a set was completed, however, they were at ends that could get way too loose. She had managed to keep them busy building a portable ticket booth, remodeling the interior of a storage closet, and building storage racks in the stagecraft room; but she was running out of ideas. And, although they were eminently lovable, they could drive her crazy! What else could they build? Why not a theatre? An outdoor courtyard theatre? In one of the two unused and unsightly courtyards within the school’s interior? That was it. This was an exceptional group of kids. They embraced the idea with a passion. So, a project proposal was written and presented to Principal Tony McNabb for approval. He gave it. Then he took the proposal to the Board of Education for their approval. They gave it. Their only caveat: the class had to raise the money and maintain the space themselves, preventing it from falling into disuse and ruin. Mrs. Freeman Lehman and her class wholeheartedly agreed. It was late in the spring of 1995. The seniors who began this project would never get to perform in this new space themselves. That awareness never seemed to daunt them. Students arranged meetings with the county building inspector and county fire marshall to get their approvals. They both provided their approval for the courtyards’ potential use as a performance space. After a courtyard was selected, students contacted a local building contractor, toured the space with him, and talked him into designing a stage. Other students went to local vendors and secured donations of salt-treated lumber, concrete, and sand. Some students began a public relations campaign throughout the school and the community, seeking donations large and small to help us build our theatre. These students generated so much enthusiasm for their project that many people donated both money and time to help create this wonderful outdoor theatre. While Mrs. Freeman Lehman was overseeing the project, the real effort and initiative was coming from students. These Theatre Production students were building a legacy of their own at the school. As it was Principal Gladys C. Burbage who had allowed, encouraged, and unwaveringly supported the theatre program at SDHS in its development, the class chose to name the outdoor courtyard theatre for her. A brass plaque containing her name was installed by the entrance to the outdoor theatre. Working extremely hard, students built the stage and began landscaping. Students continued to work, including the seniors following graduation, to complete as much as possible before the school year ended. Students not in the theatre program often stopped by to help. Faculty and staff would step outside to check progress, provide encouragement, and sometimes pitch in with their own labor. This had become a school-wide endeavor with everyone seeming to admire and support what the class was doing. By the end of the school year, the project was well underway. In the fall of 1995, work on the outdoor theatre resumed. The goal was to dedicate the theatre in the spring of 1996 by presenting the theatre program’s first production of one of Shakespeare’s plays. By the time winter weather set in, it was clear that this goal would be met. For her first foray into producing Shakespeare, Mrs. Freeman Lehman chose to present A Midsummer Night’s Dream. The Gladys C. Burbage Courtyard Theatre was dedicated in May of 1996 with its first annual production of “Shakespeare Under the Stars.” The opening dedication ceremony was attended by Mrs. Burbage, her husband, and son Kirk. The Superintendent of Schools spoke, as did Mrs. Burbage. The audience was treated to a lavish buffet provided by SDHS alumnus and chef Phil Cropper. Now in its 21st year, students at SDHS continue to “build” and renew the outdoor theatre. 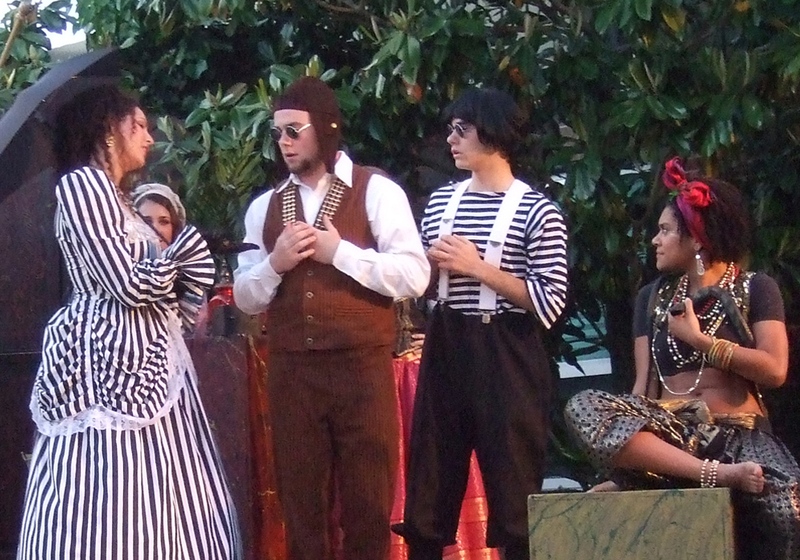 Adaptations of Shakespeare’s plays are still presented each spring in the Gladys C. Burbage Courtyard Theatre. SDHS theatre students continue to maintain, add to and enhance this beautiful performance space. Because the courtyard theatre proved to be such a wonderful space and performance venue, Mrs. Freeman Lehman began a second tradition. Each year for Halloween, the Introduction to Theatre class presents a season-appropriate short play in the outdoor theatre. Dubbed the “Moon Show,” as every title since the first has included the word “moon,” these ghost stories are played out in front of a bundled-up audience, all of whom are treated to hot mulled cider and warm gingerbread after the show. 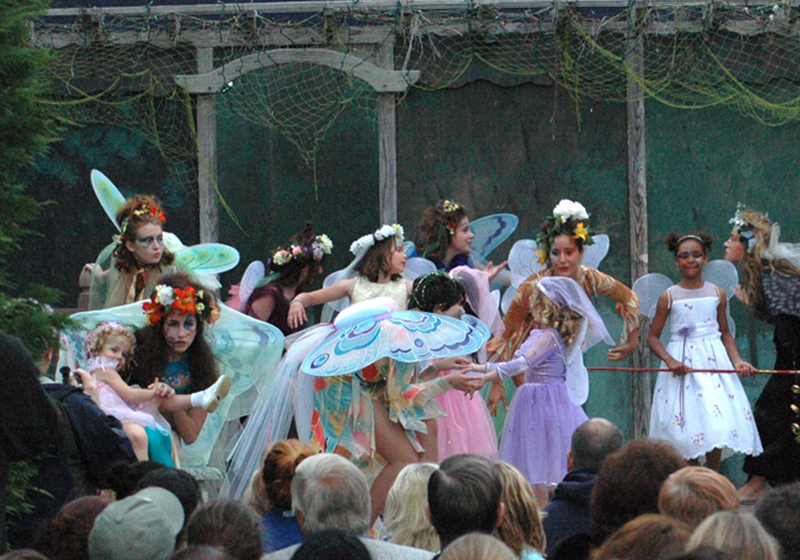 The Gladys C. Burbage Courtyard Theatre is a jewel – a rare outdoor theatre housed within the heart of a public school – built, financed, designed, and maintained by students in the theatre program at Stephen Decatur High School.